Plan a starter that can be made early in the day. These timbales are ideal, as they can be made in the morning and kept in the fridge. 1. Roughly chop all but four of the prawns and half of the smoked salmon. Combine the chopped prawns and chopped smoked salmon in a bowl with the mayonnaise, chives, lemon zest, mustard and a pinch of salt and pepper, but make sure to hold back some of the lemon zest as a garnish. 2. Scoop the avocados into another bowl and add the lemon juice and Tabasco. Mash until well combined, then season with some salt and pepper. 3. Line four ramekins with cling film. Place a layer of the smoked salmon that you didn’t chop all over the cling film, allowing a slight overhang. Fill with the avocado mixture and then with the chopped prawn and salmon mixture. Close the salmon over the base. 4. When ready to serve, invert each timbale onto a plate. Remove the cling film and garnish with the prawns you reserved, skewered with a toothpick. 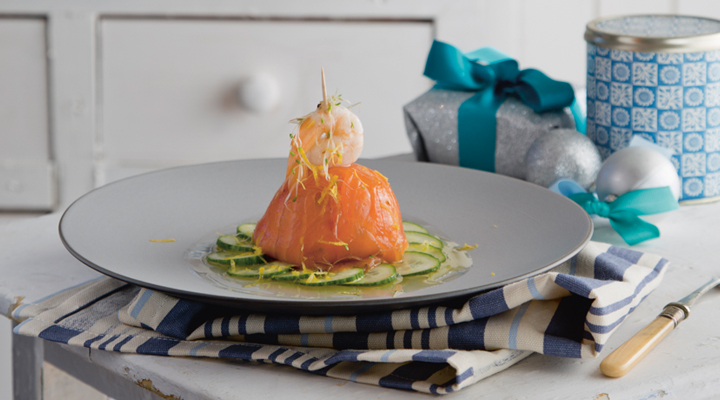 Arrange cucumber slices around each timbale, sprinkle with lemon zest and drizzle olive oil over the cucumber. Made samples to determine if I would make them for a dinner party. Just loved them! !